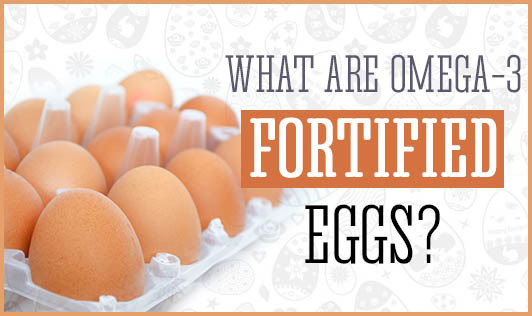 What are Omega-3 fortified eggs? Omega-3 is an essential fatty acid that possesses the ability to reduce triglyceride and cholesterol levels. Apart from this, it is also known to perform several other functions such as aid in the development of the brain, prevent the onset of dementia and asthma, and control of ADHD (Attention Deficit Hyperactive Disorder) symptoms. Several researches suggest that the nutritional content of eggs depend on the feed provided to the hen. As a result, poultry farmers have introduced a variety of eggs into the markets by modifying feeds to achieve eggs so that each has a specific benefit. One of these variants is the omega-3 fortified eggs. In this case the hen’s feed comprises of omega-3 rich sources like flax seeds. The resultant egg contains a yolk richer in omega-3 fatty acids. However, most researchers continue to debate as to how effective these eggs could be as egg yolk is already loaded with cholesterol. Also, natural sources such as salmon, fish oils, canola oil, soya bean, and flax seeds have nearly double the amount of omega-3 in them and are known to be better absorbed by the body. However, since vegetarian sources are less bioavailable and less common to find, for ova-vegetarians, these eggs can be beneficial. When you are looking for omega-3 rich foods, make sure you read the labels. Omega 3 is usually mentioned on the labels either as EPA (Ecosa Pentanoic Acid) or ALA (Alpha Linoleic Acid).